It’s finally time to get crackin’. Literally. Black walnuts are ready for shelling. 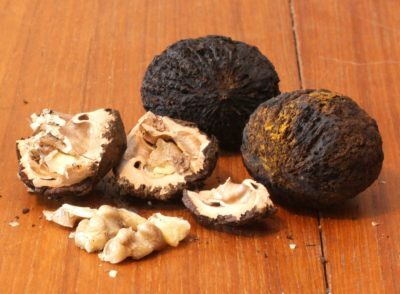 This nutty story goes back to early this past autumn as black walnut trees were shedding their nuts. The nuts fall in their husks, the whole package looking like green tennis balls. Lots of people curse the trees for littering lawns, sidewalks, and driveways. We, on the other hand, praise and collect the nuts. The first step to the present day crackin’ was husking the nuts. The soft, fleshy covering is easy to twist off the enclosed, hard-shelled nut. But we’ve also tried many methods to speed up the process, from spreading the dropped fruit in the driveway and driving over them to pounding them through a 1-1/2” hole in a thick piece of plywood to running them through a suitably modified old-fashioned corn-sheller.